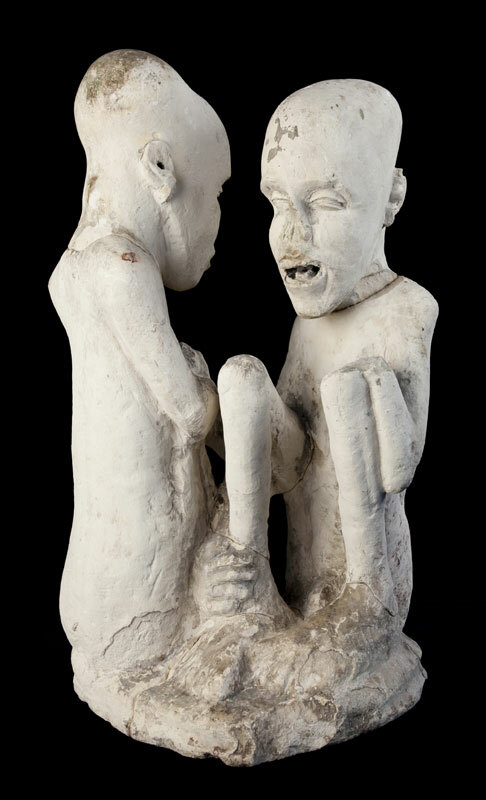 Ben Sansbury, artist, on a sculpture called ‘the Starving of Saqqara’. BS At the moment I’m very interested in things that have some kind of enigma or myth attached to them. I came across this while I was looking for objects like that and this one had so little information available, that made it even more interesting. I like the idea that it was owned by a reputable collector yet there is no record of its acquisition or provenance. GB When you first saw it, didn’t you think that it was quite ugly? BS Yes! But that’s part of the enigma. I like the way that no one can really place it in time and it’s somehow jarring to look at. Perhaps I’m interested in the mystery of the story behind it more than the object itself and the aesthetic of it becomes beautiful through that. The people who possess it in Canada have only ever put it on display for a very short time, which adds to the intrigue. It’s a contentious object and it seems they’ve handled it in a slightly cagey way. GB Well if you find beauty in mystery, it’s about as mysterious as you can get. There’s an idea that it might be from Egypt and pre-dynastic – which makes it almost impossible to date accurately. Do you know much about Saqqara? BS It was an ancient Necropolis. I didn’t research the place too specifically. I like to take inspiration from images on the internet and I’m fascinated by the way objects are constantly re-contextualized through their use online. For example, the same few texts about this have been used over and over again on different websites and it just adds to the myth. GB And there’s an inscription on the sculpture that no one can understand. BS Yes, and traces of paint. They think it might have been painted. The idea of the text is the most fascinating aspect of it for me. It might be a clue to the development of language but also might be completely made up or misconstrued. I love things like the Voynich Manuscript too, even though I know someone now claim’s to have cracked that text. GB Do you have a theory about the relationship between the two characters? BS I was initially interested to work out if they were cowering or embracing and why someone would make a sculpture of people who were starving or imprisoned. No one even knows where the sculpture got its name and reference to Saqqara. GB Do the elongated heads interest you? BS Yes. in the sense that the shape of the heads excite conspiracy theorists as do many other examples of artificial cranial deformation. There are references to elongated skulls in many cultures worldwide – but there’s a bonkers theory that they are aliens or people who had seen aliens and wanted to look like them and thus had started to alter the cranial form of their infants from birth. GB The Paracas skulls from Peru were in the news a few months ago. Someone claimed that they’d DNA tested them and it wasn’t human DNA. BS Yes and there are claims by sailors who sailed through the Magellan Strait and claimed to have met giants in the 17th Century. Maybe there was a particularly tall group of people there? Maybe there were more variations of humans than we believe. I like the theory that homo sapiens would hunt and operate in the daytime whereas Neanderthals were less aggressive, a bit more intelligent and perhaps more nocturnal. GB So do these ideas come up in your work? BS In my own work and life in general I’m interested in how rumour and stories combine with facts so this object represents that combination – and how we use our imagination and create these myths. I’ve also been reading about pereidolia – seeing human or other forms in things. Leonardo da Vinci advised painters to look for this and use it in their work. GB Do you want to know why people in the ancient world created sculptures? Do you think it was ever art for art’s sake? BS Apparently, as people improve agriculture and have more than sufficient food production, that’s when they start to make objects that are conceptual or merely not for the sake of sustenance or survival. GB So do you try to make your own work visually beautiful as well as having these intellectual associations with the distant past and mystery? BS In a way. I wanted to make sculptures how you might make an abstract painting, to compose it in an intuitive way rather than having a clear idea of an end result. For example with my plaster work I’ve been producing I don’t create a mold from a master, I start directly with the mold and consequently I’m never entirely sure how they’ll look until they’re cast. But ultimately I take the forms and shapes I’ve found through all this research and put them together in quite an unconscious way. GB So where is the highest beauty for you? Is it in nature or random objects that aren’t consciously art? BS I love the combination of nature and man-made things – like a chain link fence that has a tree that’s grown into it. The tree has the beauty of solid strength, minute but constant growth. That slow but constant pace is what always overcomes man’s creations. That’s beautiful. BS With this sculpture the beauty is in the story and the mystery and the object would be less interesting to me without that. It makes me wonder why it’s important to know about it, and I like the suspense of trying to discover what things are. I like things like the tree growing around the fence because you can’t control it. GB Do you tend to like things that aren’t supposed to be beautiful? BS Not necessarily. I used to have to visit Florence and often had time to kill. I love the Uffizi but didn’t want to queue for hours, so I’d go to the archaeological museum nearby which has a great collection but was pretty rough round the edges in a fascinating way. GB So rather than looking for virtuosity or prescribed forms of beauty, you like there to be an imperfection or a space for the imagination to operate in? BS Yes. In this case there were incredibly beautiful objects on display in this slightly neglected environment. There were empty display cases in that museum that look as though they might have held something amazing – but now you can only guess. There was also a staircase there that was partly made from scaffolding with all these layers of gaffer tape around the tubes opposite a wooden flight case with a Roman Frieze on it, around the corner from the Etruscan masterpiece the Chimera of Arezzo, like a transient archaeological installation.